Wedding PR: United With Love, Brides.com, Maharani Weddings, and more! This week brings some new and exciting client features, including United with Love, Brides.com, Maharani Weddings, and so much more! Check it all out below! 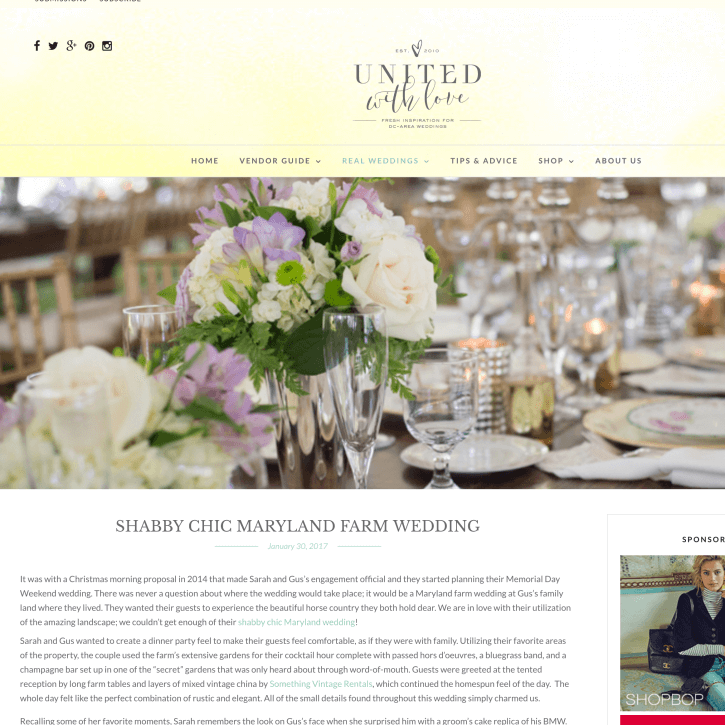 Mike B Photography was featured on United with Love with his feature, Shabby Chic Maryland Farm Wedding. See the full feature here. Passport to Joy, Destination Weddings Travel Group, Cocoon Events Management Group, and Taylor’d Events Group were featured on Brides.com with their article, 8 Special Ways to Add a Personal Touch to Your Wedding. See the full feature here. Taylor’d Events Group was featured on Maharani Weddings with their feature, Seattle, WA Fusion Indian Wedding by Alante Photography. See the full feature here. Belladeux Event Design was featured on Timeline Genius with her article, Managing Personalities Throughout an Event. See the full article here. 100 Candles was featured on Rocky Mountain Bride with their article, Aisle Society Experience presented by Minted: Fall Bridal Fashion Week Party. See the full feature here. Belladeux Event Design and OFD Consulting were featured in Wedding Business Magazine with their article, The Wedding Business Magazine, January 2017. See the full feature here. Belladeux Event Design was featured on Social Tables with their article, The Art of Managing Vendor Conflicts and Client Relationships in Event Planning. See the full article here. OFD Consulting was featured on Social Tables with their article, How Event Planners Can Use Effective Storytelling to Win Over Clients. See the full article here.